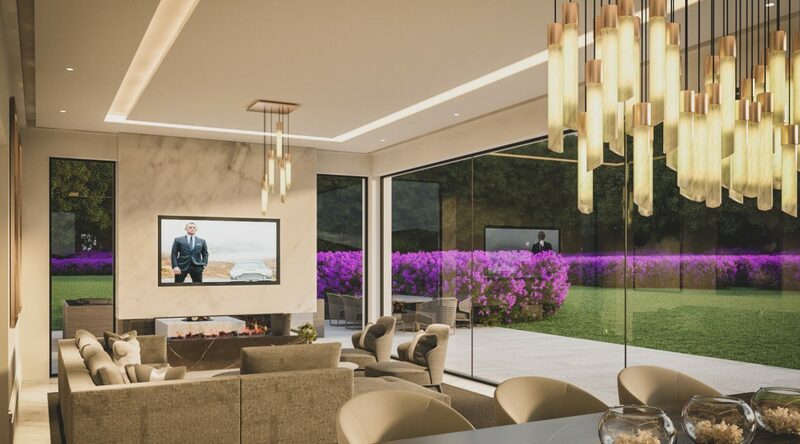 This project involved the delivery of a full renovation and interior design solution for a three storey property close to the idyllic village of Prestbury. A significant challenge was that, whilst the location of this extensive family house was exceptional, the building itself sat rather awkwardly on its plot. In addition, the internal layout and décor was somewhat dated and, as the property had been vacant for some time, it had also fallen into a state of disrepair. In short, extensive remodelling and a design overhaul was required to allow it to complement modern family life. We worked in tandem with the incumbent architects, Maison IOM, to deliver on the brief. 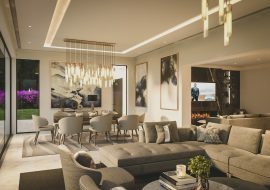 The creative interpretation of space, scale and proportion was pivotal in enabling us to transform a rather cumbersome property into a unique family home which offers the very best of modern living. The transformation of this property begins in the entrance hall which has been skilfully brought up to date with a grey stained oak herringbone floor complete with an inlaid perimeter banding detail which serves to subtly frame the space. To set a tone of timeless elegance, we introduced a statement sweeping staircase, the walls of which feature a plastered string detail in a muted shade of grey. 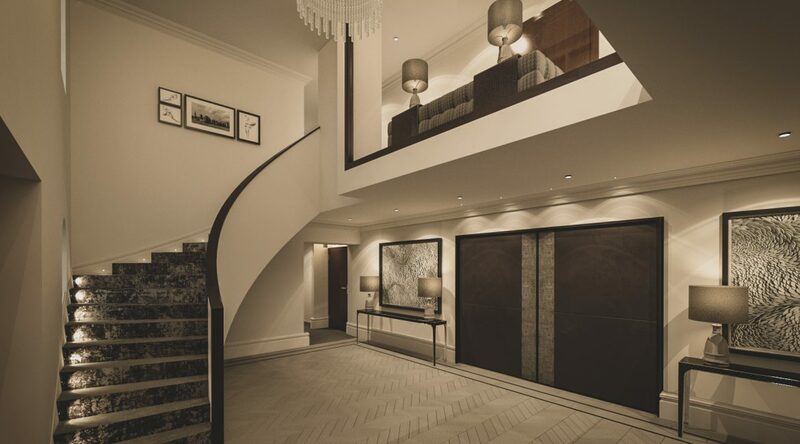 With a carpet of faux silk and a high gloss ebonised oak handrail, it speaks of understated sophistication. 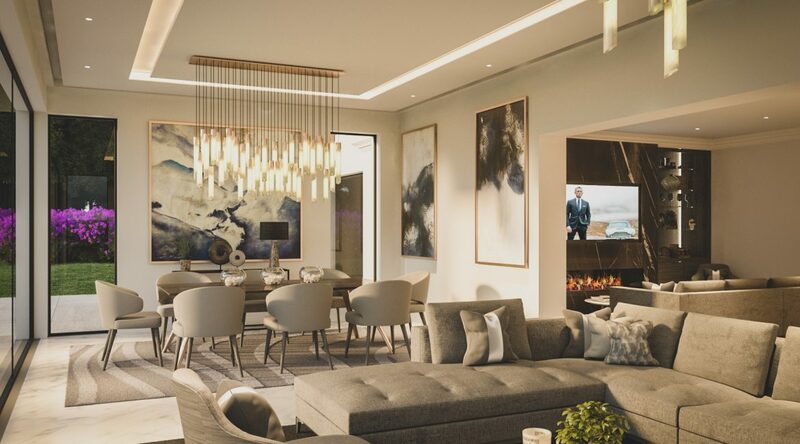 The hall is styled with console tables in a rich dark stained timber and bespoke artwork on the walls for a luxury hotel feel, whilst a bespoke crystal chandelier adds a touch of glamour. Upholstered leather double doors draw the guest onwards into the heart of the home – the open plan kitchen, day living and dining areas. 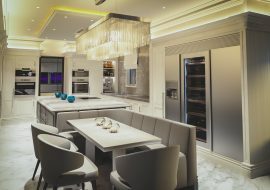 The kitchen is designed as a classic contemporary space with stylish raised and fielded panel cabinetry which is hand-painted in neutral tones. 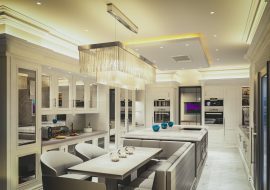 The central feature island in a contrasting darker hue adds depth as well as light and shade to the scheme. 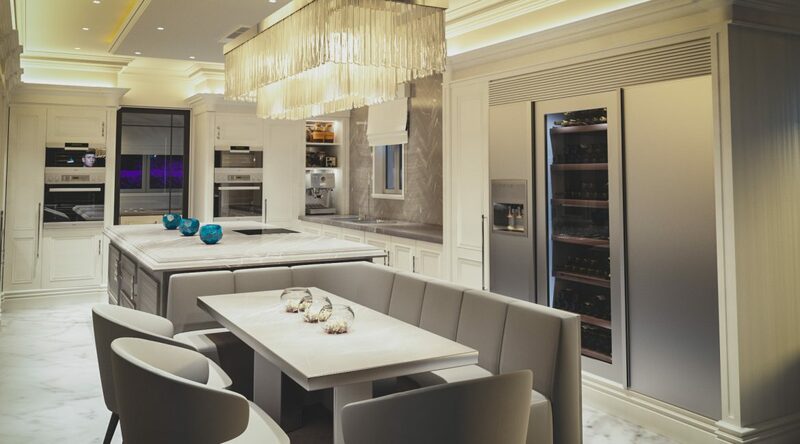 A coffered ceiling detail with halo lighting mirrors the shape of the island, further highlighting this focal point in the room, whilst banquette upholstered seating to the side of it offers an informal dining space for the entire family. 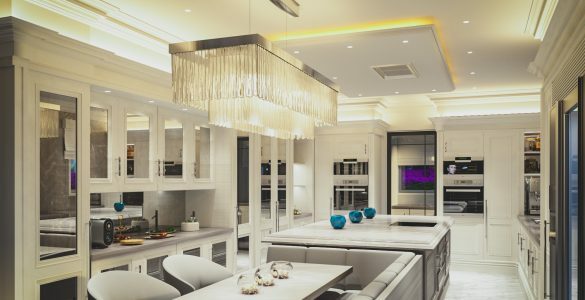 A feeling of opulence is cultivated with the use of large format marble tiles on the floor, worktops in contrasting super white and grey marble quartzite, a wall of cabinetry with antique eglomise mirror inlays and a multidrop murano glass chandelier. A crittal glazed door to one end leads into a pantry kitchen which discretely hides any culinary paraphernalia from view. From the kitchen the space morphs effortlessly into a media lounge where the eye is immediately drawn to a ribbon fire with a television mounted above. 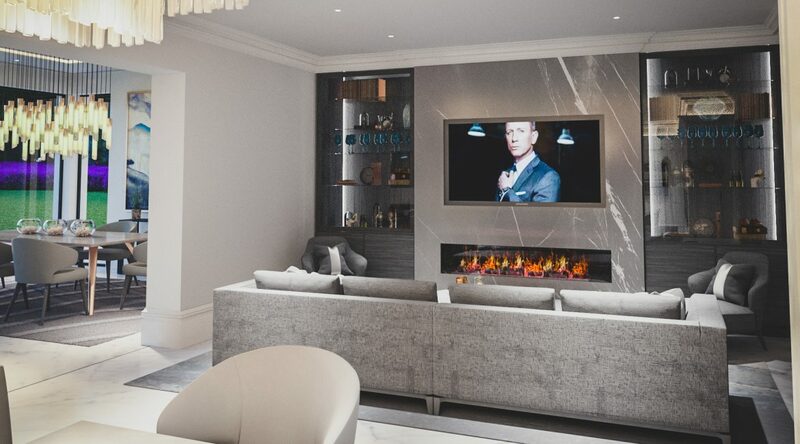 To ensure continuity throughout the scheme, the chimney breast is clad with a marble effect treatment, whilst the marble floor flows seamlessly into the space and the feature lighting subtly references that of the kitchen. 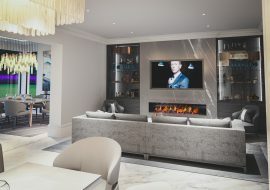 Flanking either side of the chimney breast are bespoke-made high gloss, glass fronted cabinets with feature illuminated shelving. Elegant Italian furniture sits atop a faux silk rug to complete the look. Beyond the kitchen living area a rather dated extension has been replaced with a sleek orangerie with full width sliding glazed doors. This space has been designed to offer a contemporary day living and dining area. A defining feature of this space is the indoor outdoor fireplace with ribbon fire. 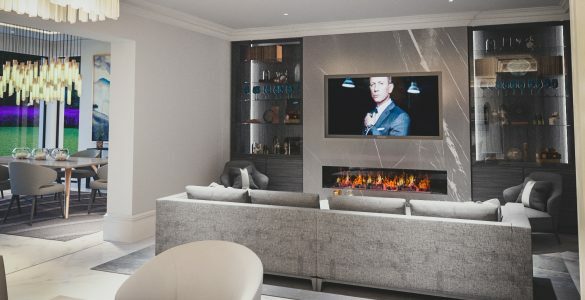 With a look reminiscent of the most stylish of European homes, the chimney breast in white marble offers an exquisite contrast to the black marble plinth that the fire sits upon. 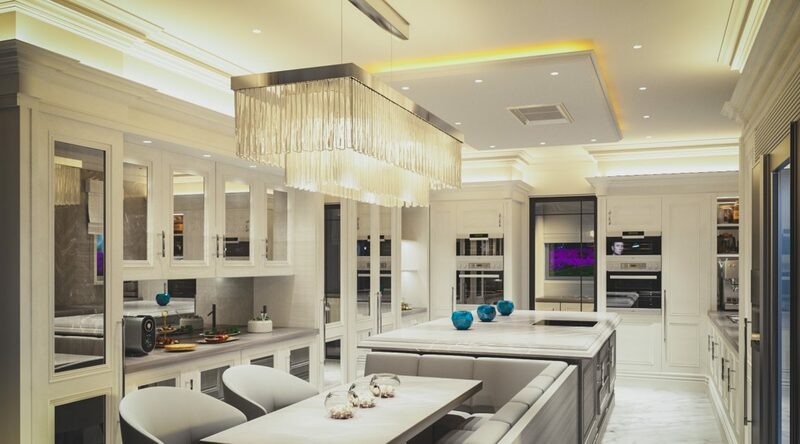 We designed the space with different lighting options to allow for subtle changes in tone. 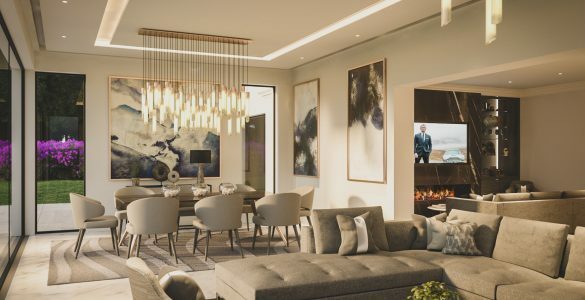 The illuminated coffered ceiling detail creates a sense of drama, whilst feature drop pendants with antique brass detailing allow for a more intimate tone to be set. Attention to every last detail is the benchmark of superlative design – a perfect example comes in the form of the double window treatments in this space. Blinds set into a recess above the windows offer a practical solution to sun glare, whilst dress curtains on a motorised track are tucked into the walls and allow for a more atmospheric evening look. At the further end of the orangerie, a contemporary faux silk rug artfully delineates the dining area. Thoughtfully designed with family life in mind, a covered outdoor play area sits just beyond the glazed doors. Abstract artwork and stylish Italian furniture throughout create a tone of approachable luxury. 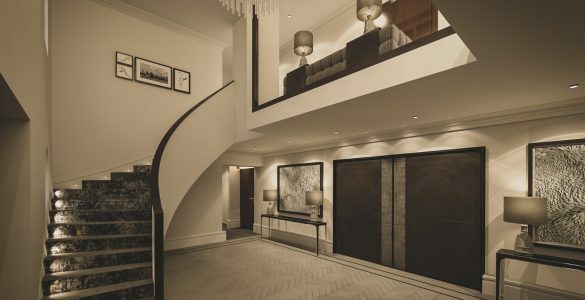 Ascending to the first floor, the landing was remodelled rather extensively in order to augment the space. 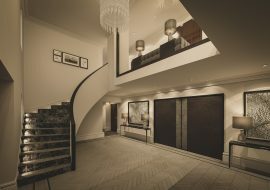 A seating area set adjacent to contemporary glass balustrading allows for a view of the hall whilst the framing detail to the glazed panel, as well as the architraves, handrails and doors on the landing are all crafted from ebonised oak to create a seamless journey from the hallway below. The bedroom accommodation is laid over the first and second floors with the first floor playing host to the master suite, comprising of a bedroom, lounge, dressing room and en suite bathroom; as well as three additional bedrooms each with en suite bathrooms. The second floor houses a further guest bedroom and a self-contained nanny apartment. 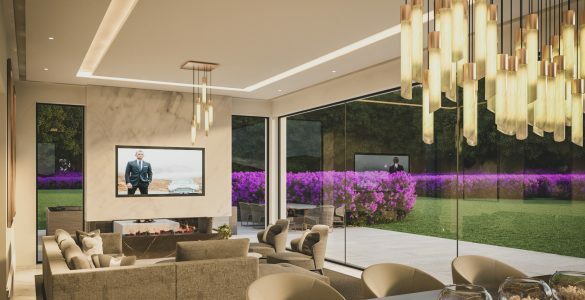 Phase two of this monumental remodelling project involves an extension to the basement area which will house a garage, housekeeper’s suite, gym, play area, hair salon, and a large entertainment area and bar as the piece de resistance. 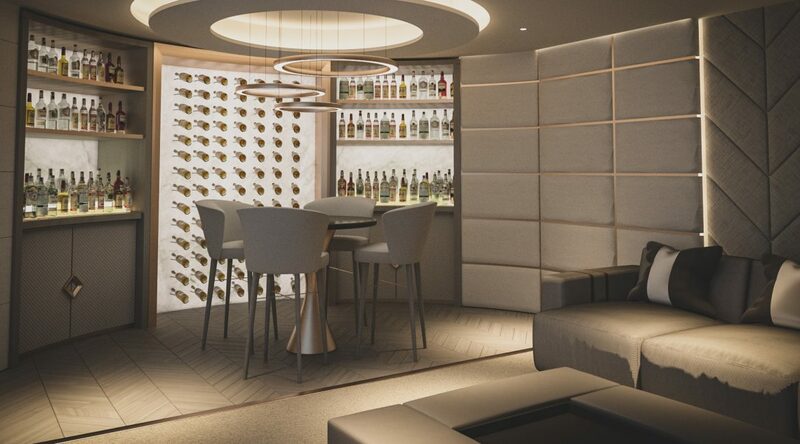 This space will be crafted to rival the most exclusive contemporary cocktail bars. Rich, tactile textures and ambient lighting will offer a chic environment in which to unwind with friends. 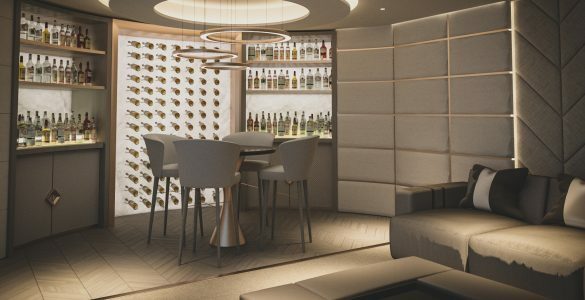 The walls will feature upholstered panels with inlaid bronze detailing whilst the cabinetry will be adorned with quilted stitched leather and bespoke brass detail handles. 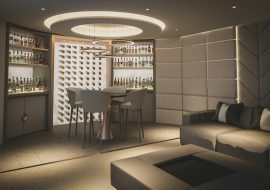 A full height wine display and bottle storage displays will be set against a backdrop of backlit alabaster. A poker table with an artfully crafted cylindrical brass base is designed to sit in a central position in the bar whilst a halo ceiling detail will highlight it from above complemented by a cascading contemporary LED feature light. This project required all of our creative vision and technical expertise. Working with an existing property can often be more challenging than designing an entirely new space. 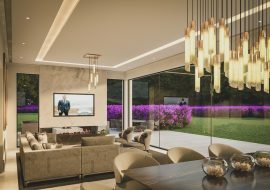 In this case we were able, with minimal structural change, to remodel the space planning and transform the house into an ultra-stylish yet eminently functional family home.